A few days ago we discussed Paul’s appearance in the midst of the Areopagus here. We noted that several classical and New Testament scholars indicate that the Areopagus (the court) of Athens originally met on the hill commonly called Mar’s Hill or the Areopagus, but that the court later met in the agora. Our photo below was made from atop the Areopagus. 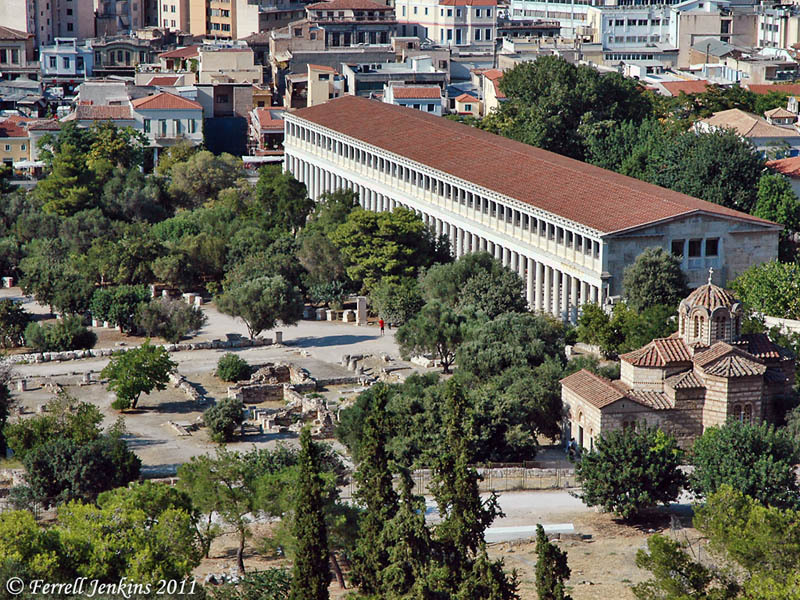 It shows a small part of the ancient agora and the Stoa of Attalus in the center of the city of Athens. View showing a portion of the agora and the Stoa of Attalus. Photo by Ferrell Jenkins. The Stoa of Attalus was built by King Attalos II of Pergamum (159-138 B.C.). It has been reconstructed and now serves as the Agora Museum. In Roman times the court held most of its meetings in the Royal Portico (stoa basileios) in the agora, but we still don’t know whether Paul addressed the court in the Royal Portico or on the Areopagus (Bruce, Paul: Apostle of the Heart Set Free, 238). This entry was posted in Bible Places, Bible Study, Culture, Greece, New Testament, Photography, Travel and tagged Apostle Paul, Athens. Bookmark the permalink.